Blum brings a variety of positives to a roster already filled with experience. The infielder is now in his 12th Major League season and owns a .251 career batting average. In addition to his flexibility in the field, he’s also a switch-hitter. Blum has smacked 97 home runs in his career, including 28 long balls that gave his team the lead. He’s also homered in 27 different ballparks and off 85 different pitchers. He’s no stranger to the National League West as he played for the Padres from 2006-07. Blum has also hit well against several of the D-backs’ foes. 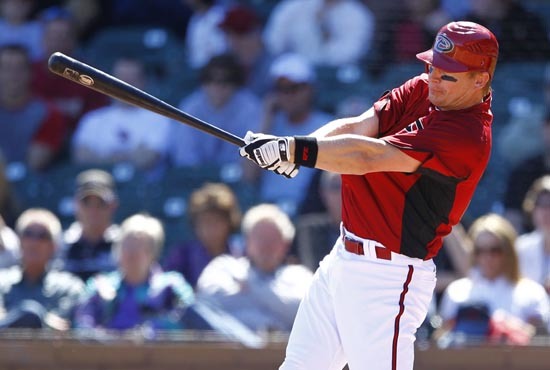 He’s a .400 lifetime hitter against Colorado’s Ubaldo Jimenez and the Giants’ Brian Wilson. Blum has also hit .522 against San Diego’s Aaron Harang. After playing for Houston in 2010, he inked a two-year deal with the D-backs this past winter. Now in July, Blum is thrilled to be joining a team in the thick of a division race. During Spring Training, Blum suffered an injury to his right knee. He underwent arthroscopic surgery and missed the season’s entire first half. The veteran then trained and worked to help his knee heal at the team’s Spring Training facility in Scottsdale. After a Minor League rehab assignment, Blum was activated last Friday. It was a trying time for Blum, who yearned to be on the field contributing to the big league club. Since returning from the disabled list, Blum has played in three games for the D-backs, two of which were starts. He started last Saturday against the Dodgers and drilled a double for his first hit of 2011. As the season progresses, it is unclear as to what exactly Blum’s role will be. He’s capable of playing all of the infield positions, and figures to serve as a formidable pinch hitter off the bench. None of that matters to him as he simply wants to win.